The elusive Lego scooter found! This is not an authorized Lego accessory but more of a creation of some passionate “brick” modelers. I am not sure where you can find the riders or the headlight either but this link will at least set you on the right path. The scooter is $6 and comes in red, black, white, dark blue, medium blue, dark green, and yellow. 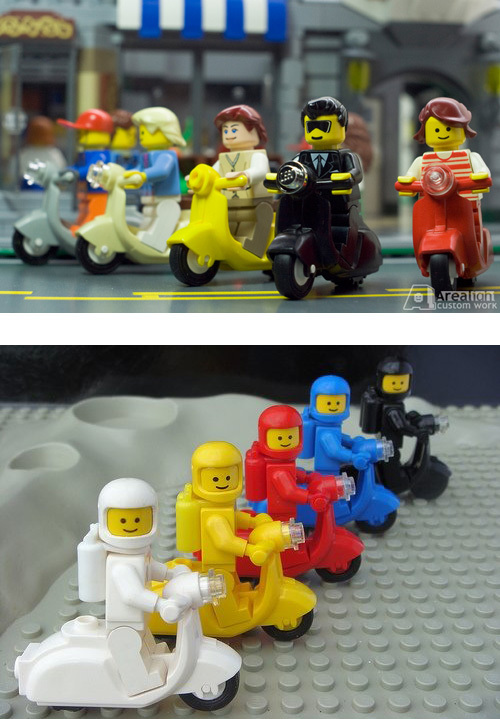 If anyone knows more about scooter Legos, please let us know at tips (at) scooterswag.com! And thanks to our very own Cassie for this find . . . This entry was posted in Models, Figurines, Toys and tagged lego, scooter, vespa by Tracy. Bookmark the permalink. where can i get one of these ?